This memorial was erected on Bays Hill next to the Swartkop Air Force Base and offers a view of the base. The South African Air Force was established here in 1922. 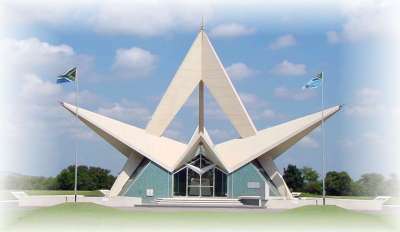 It was erected in memory of the some 3 000 members of the Air Force who died in war and during peacetime. This building (six storeys high) is designed in the shape of a triangular star and consists of three wings. One if these is a neutral chapel for family services. A memorial hall and memorial stone on a scarlet red background takes up the centre. The memorial also includes a garden of remembrance and an amphitheatre for 5 000 people. The wrought iron entrance gates were previously used at the old SAAF memorial in Waterkloof.